Line drawing of a leaping rabbit. 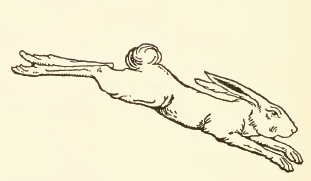 This line drawing depicts a rabbit at its prime – mid leap. Their hind legs are so strong that they can leap quite high and run so very fast. This rabbit drawing is in the public domain. While it was originally published at the angle you see now, you could easily rotate the image to make it look like a rabbit all stretched out along the ground.